These belts have incredible metal finding sets interspersed with fine grade leather. The metal piece sets are reminiscent of a Versace design, silver and gold with a small lions head. The width is one and half inch. One is a matte black "plonget" cowhide, soft and durable, the other is a streaked tan cowhide with a raised grain. All of our "wrapped leather belts" are fine grade leather wrapped on strap leather interiors with a soft leather backing, so each belt is made from 3 pieces of leather. Customers comment that our belts are so soft to the touch yet strong and durable because of their construction. These 2 belts and the bag are available now Off Rack. Because these are limited edition pieces, the price has been reduced. 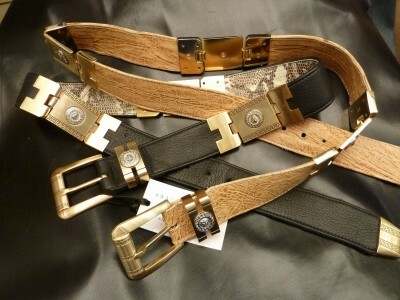 The black belt is size 36-39" and the tan belt is 38-40"...both can shortened in size by request. 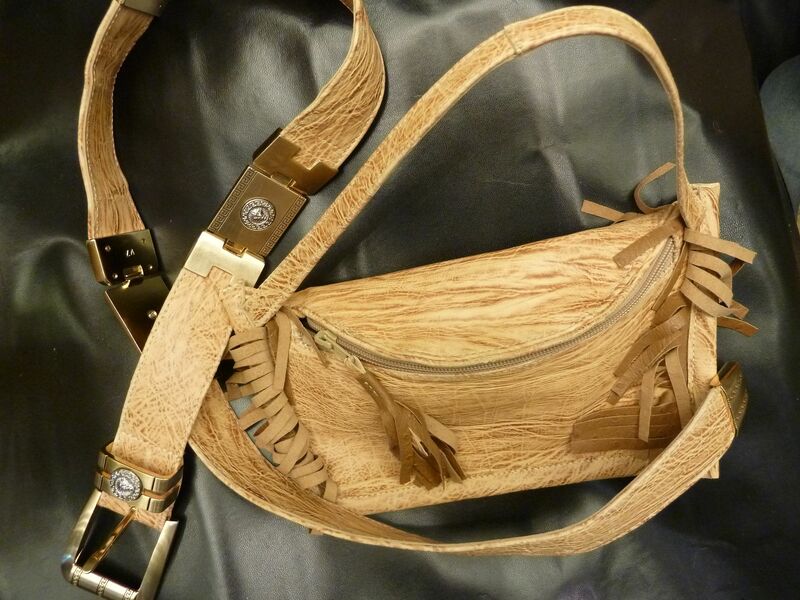 Also shown is a cute little handbag that matches the Tan belt, also on sale (please inquire if interested). We have one more set of metal pieces which can be custom ordered at full price.